Join us for another sketchcrawl in Davis California! 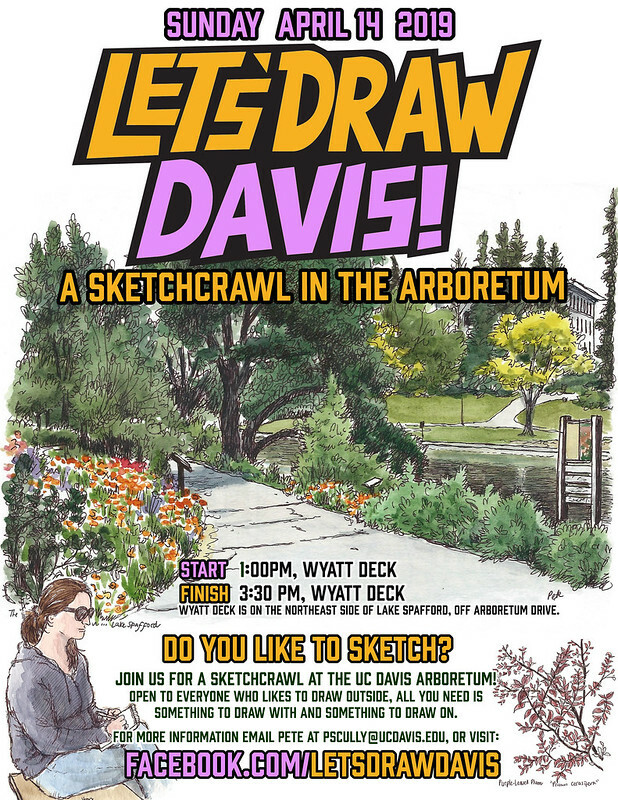 This time we will head back to the Arboretum, one of the prettiest places on the UC Davis campus in the springtime, and spend a couple of hours sketching the plants and scenery. It’s the day after Picnic Day, so campus should be a lot calmer and quieter. We will start at Wyatt Deck, which is located on the northeast side of Lake Spafford and just off of Arboretum Drive (near Wyatt Pavilion, the oldest building on campus) at 1:00pm, and I will give a short intro to botanical sketching. We will then go off and sketch solo or in groups, around the Arboretum, and then regroup at 3:30pm back at Wyatt Deck to look at each other’s sketchbooks. As always this event is FREE and open to anyone who likes to sketch outside. All you need is something to draw with and something to draw on. And a small foldout stool might be handy! 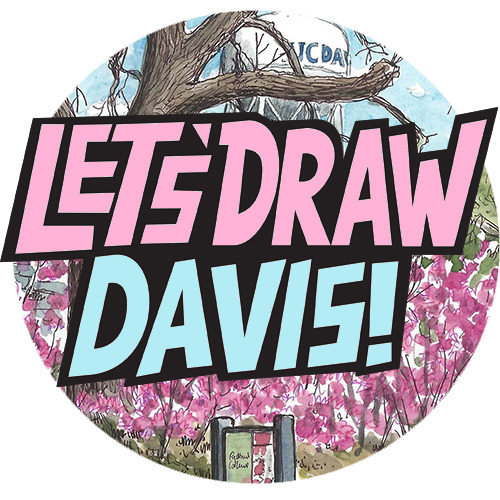 I will provide little maps of the Arboretum on the day, and everyone will get a ‘Let’s Draw Davis’ sticker. 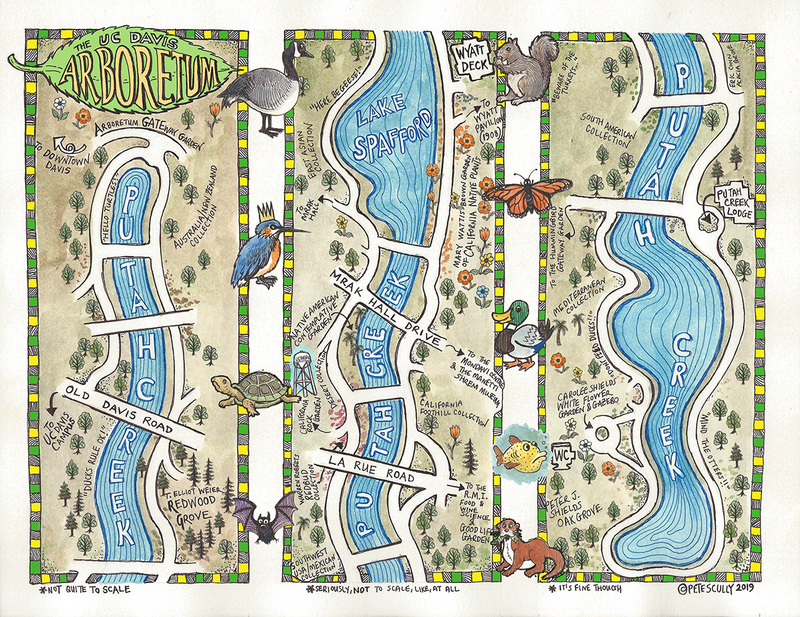 I drew a map of the Arboretum (I really like drawing maps) which you can use if you come along. It’s not to scale, but shows whereabouts things are. It’ll be the nice quiet day after Picnic Day, and what better way than to spend it sketching among the flowers? Hope to see you Sunday! Very nice map of yours. Reminds me of adventure spreads in school foreign language books from the 70’s and 80’s. See “First Thousand Words In Italian”, if it’s still about. Cheers!